Lewis Hamilton claimed pole position for the Australian Grand Prix as Mercedes mastered Formula 1’s controversial new qualifying format. 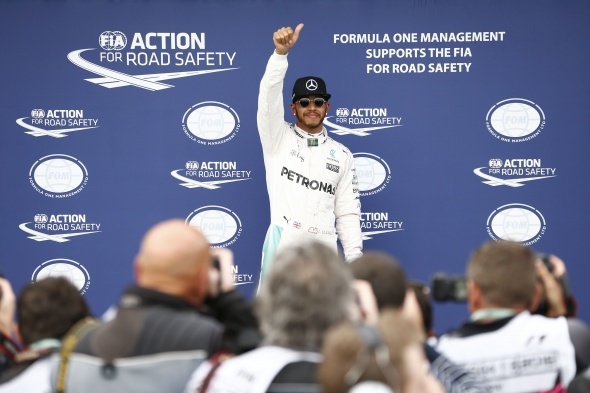 Hamilton topped the initial stages of Q3 before lowering his own time with a 1:23.837 as he secured the 50th pole position of his career. Nico Rosberg was only fourth after the initial runs in Q3 before improving to second position, 0.360s down on Hamilton, as he completed a Mercedes 1-2. Ferrari was third and fourth, with Sebastian Vettel 0.838s adrift of Hamilton but three-tenths clear of Kimi Räikkönen. Max Verstappen secured fifth on the grid for Toro Rosso, his best qualifying result, ahead of Felipe Massa, Carlos Sainz Jr. and Daniel Ricciardo. The new live knockout qualifying format proved to be an anti-climax, with the majority of the action coming during the opening stages of each session. Sergio Pérez and Nico Hülkenberg were ninth and 10th and opted to return to the pits rather than attempt another lap, while Valtteri Bottas made a minor error at the final corner and placed 11th. McLaren was initially impressive in Q1 but was unable to translate its pace in the next session, with Fernando Alonso and Jenson Button in 12th and 13th. Renault made it into Q2 upon its full-scale return to Formula 1 but was significantly off the pace, leaving Jolyon Palmer and Kevin Magnussen down in 14th and 15th positions. Neither Sauber driver progressed out of Q1 as Marcus Ericsson placed 16th, with Felipe Nasr in 17th position. Red Bull’s Daniil Kvyat was the biggest faller in 18th position, while Haas appeared to send its drivers out too late, leaving Romain Grosjean and Esteban Gutiérrez in 19th and 20th. Manor rookies Rio Haryanto and Pascal Wehrlein will start at the back after being left in the pit lane during the initial knockout stages. Haryanto, however, will drop behind Wehrlein after being given a grid penalty for hitting Grosjean in the final practice session.